Shipped quickly and the product was as advertised. Thank you! David was awesome to deal with when it came to wiring the unit up. The unit was not affected by the canbus system on the BMW. I really like the strobe feature of the brake light and the light is extremely bright. 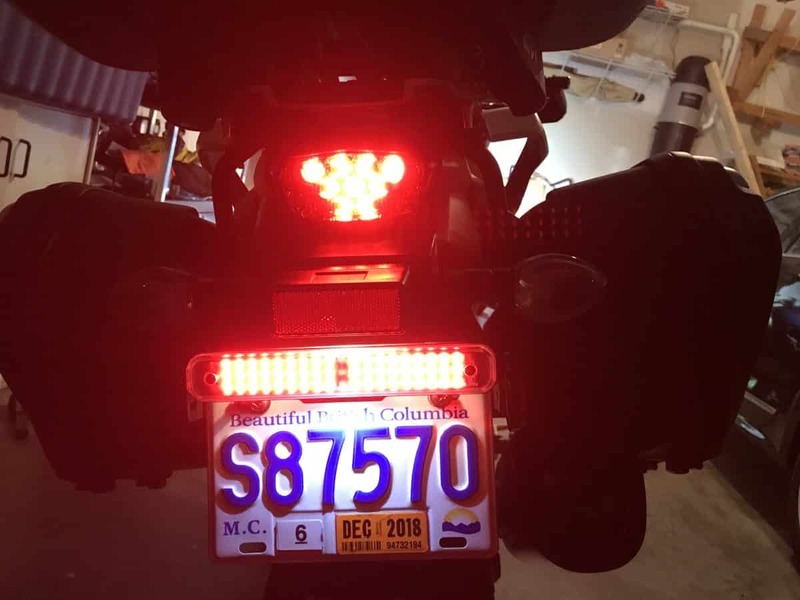 I’ve had my light bar on my Indian Roadmaster for two years now and it has worked flawlessly. I mounted it just below the trunk. I also bought the harness adapter which is not needed if you mount the bar on your license plate. Yesterday I downloaded and installed firmware that was not specific to the Indian. It did not work. I called support and explained what I had done and within a half hour I had the latest firmware for the Indian. They also, within hours, updated their website in order to avoid any future confusion. It now reads “(All Motorcycles except Indian Motorcycles)” for all firmware updates. This is a superior product and the support is excellent. Vipul, we’re sorry to hear about the problems you are having with your Light Bar. We have replied to you (6 days ago). We will try once again however please check your spam folders as our replay is also likely to be blocked. I have added 2 extra brake lights on my spyder. One just above the lic. Plate and one on the trunk. I feel confident that people really see me, as soon as I slow down and brake they give me more room. Great lights everyone should add an AdMore brake light to their bikes. This light bar is just what I was looking for. The installation was a breeze utilizing the Plug & Play wiring adapter for my Indian Roadmaster. I also purchased the extra connector to ease seat removal, also a snap to assemble. Programming of the unit was simplistic with a load of options to fit my needs. I mounted the unit just below the trunk. The light bar appears as if it was designed to be there. My days of tapping the brakes are now behind me. I would highly recommend this light bar, a perfect addition. I have a Suzuki 2014 V Strom 1000 ABS, I have installed the Admore Light Bar with Smart Brake Technology! I also bought the Plug and Play harness with the light bar to fit my V Strom 1000, it was a simple plugin. I love the extra brake light signal light combination, I feel that this is an important add to making my ride safer in traffic. I would recommend this to motorcyclist that ride all types of motorcycles. Makes me feel safer. Quality is great. Installation was very straightforward and only took minutes. I do know I’m more visible now. I recommend it! Just had my dealer do the install. He said they had done several of these since the MOA rally. Install was straight forward for him. Both my husband and I now have this device. We’ve only had one ride so far and we are pleased and impressed. Following my husband, I, at first, thought he might be riding his brake, but quickly realized it was the (de)accelerometer that was lighting up with engine braking. No problem, and will be good when followed by others. The construction of the device looks and feels solid. They were shipped promptly from the manufacturer. So far, we’re glad to have this light bar. It sits very gracefully along the base of our license frames. Bright and visible! Thanks! Excellent, very effective product. Customer service was outstanding – and the minor isdues they responded too were entirely of my own making! Thanks Dave! Worked perfectly with default settings right out of the box. Very pleased with this safety upgrade. This light is FANTASTIC!!! If you have an Indian this is the way to go. In stop and go traffic, in the daytime, the cars back off. I put this on my 2016 Indian Roadmaster and its the best light out there. With the Plug and Play Adapter the installation was easy. Thanks for making the adapter. It is important to understand that this light is controlled by a central processor, and it must have a continuous connection to voltage on the processor lead in order for any of the functions to work. You cannot use it if you do not have voltage going into the “rear tail light” lead, which is also the central processor. Older bikes that do not turn on the lights continuously are problematic. Very good product. Works as advertised. Easy to change programming. Lots of positive feedback from other riders.